Perumal moves to Puducherry to grace the devotees on Masi Magam day (February-March). Special pujas are performed on Vaikunda Ekadasi day in December-January. The idol is 14 feet long in a reclining form. 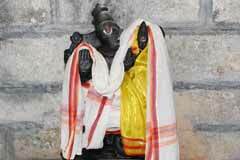 It is believed that devotees of Perumal are not afraid of Yama, the Lord of death. We can also worship Prahladha, in the temple. 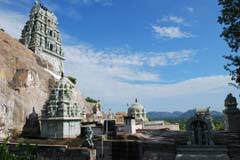 The temple is open from 8.00 a.m. to 10.00 a.m. and 4.00 p.m. to 6.00 p.m.
Sri Singavaram Perumal Temple, Singavaram, Villupuram district. On the rear wall of the sanctum sanctorum, Gandharvas (a community of the upper world known for their music skill), Brahmma on the naval of Lord Vishnu, Garuda, Madhu-kaidaba, the demons destroyed by Vishnu grace the devotees. Consort Sri Bhoomidevi graces from the feet of the Lord. Prahlada near His knee and Lord’s discus grace the devotees. Two pillars in the front space are square in shape with white flat forms in the middle where lotus flowers are carved. 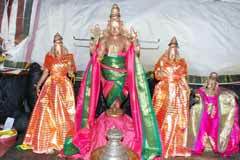 Those completing 60 years of age celebrate Sashti Apthapoorthi in the temple. 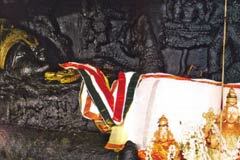 Devotees offer Tirumanjanam and Vastras to Perumal. A temple is noted for Sashtiapthapoorthi celebrations. Perumal is the family deity of King Desingu Raja then ruling the region. 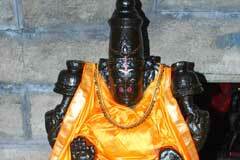 Once, while preparing for a war, Desingu came to the temple to worship Perumal. Perumal was not in favour of his war plans and turned His face against the king. We can have a look of this form today too. According to history, Desingu only continued the march, defeated the enemies but died at the battlefield. In Tirukadayur, Lord Shiva destroyed Yama the lord of death. 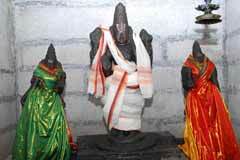 In Singavaram, Perumal faces South, the direction of Yama as if warning him from threatening His devotees of death. 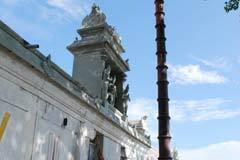 It is firmly believed that devotees of Perumal are not afraid of Yama. 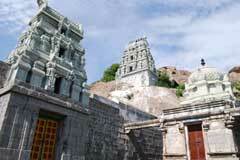 Those completing 60, 70 and 80 years are advised to celebrate their birth days in this temple. Perumal has His consort Sri Mahalakshmi on His chest, keeping His feet facing North, the direction of Kubera, the lord of wealth. Those worshipping Perumal in this form will never have to face poverty in their lives. Mother Ranganayaki’s shrine is just a little below the top hill level on a rock on the south. Sri Durgha graces from a rock. 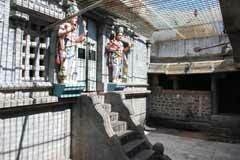 There is a four pillar Mandap at the steps leading to the temple. There are sculptures of conch, discus, Namam the Tilak of Sriman Narayana, His feet and Sri Hanuman in five forms. 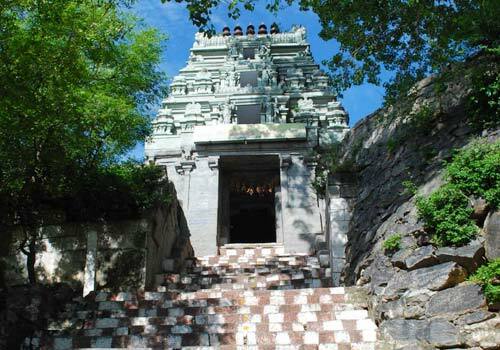 On the way to the hill is the Lakshmi Theertham spring and Sri Lakshmi temple. Demon king Hiranya Kasibu proclaimed a law that his subjects should worship only him and not any other Gods. Everybody obeyed except his own son Prahlada and opposed the order vehemently. The exasperated king used all the ways to eliminate his own son to establish his law. Lord Narayana (Perumal) destroyed the tyrant king, protected Prahladha and had him by his side. The temple is built on the philosophy that noble traits are not alien even to those born in a demon dynasty. Singavaram is 6 km from Zenji on the Mel Malayanur Road. Bus facility is available from Zenji.